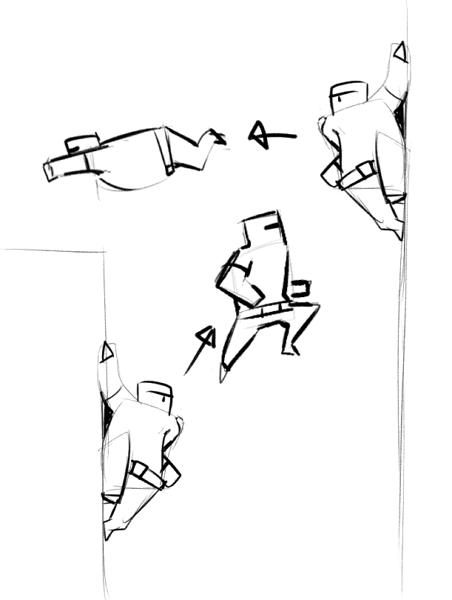 at the moment in the game you can catch players with the help of the dive who fall from a great height to avoid the damage from falling (I like to catch players in this way) the only movement of teamwork. movements of individual use will also be offered. you have to be sad that you can not jump onto a high wall? or is there a big chasm in front of you? a friend with hands will help you! vertical activates the "block" horizontal activates the "kick" this is decided by the one who will jump. there were moments when you are holding onto the ledge, and the enemy is waiting while you jump? it's time to be sad for the enemy! you can be more maneuverable with walls, as far as your stamina allows! I think that this can interfere with the game, so this movement will be activated during the jump when you are pressed against the wall with the clamped "up"
I think that you need to speed up the choice of weapons as in superfighters, or increase the damage, but this is another story. I hope I was useful! What do you think? The first would help filling the lack of teamwork options in the game. Usually all your interaction with your teammates is just "not shooting them", or just throwing a gun at them. Having more ways to interact with your team is definitely something I'd love in the game. Not so sure about the third one, it seems quite hard to implement, and would make "blancing" maps more difficult. I love the first two, and the drawings are also great. But I dont know if the devs are going to add new moves this late in developement. You can still hope, tho. I really like the first two ideas. I feel like the last one though is a bit of a stretch. We already have ledge grabbing and I feel like this isn’t really needed. However, even though these ideas are rest, the devs have to really think about what they want there game to be like. In the new update they removed the recovery roll feature in order to further there agenda. So unfortunately, even though I and many others may think these ideas are great, it is more important that the devs create the product that they are proud of. I think we already have Walltap thing. I mean technique of using wall in map editor to get an result. And this is not an invisible platforms or objects. I really like the first 2 ideas, especially the first one - more teamwork-related features should be added to the game. 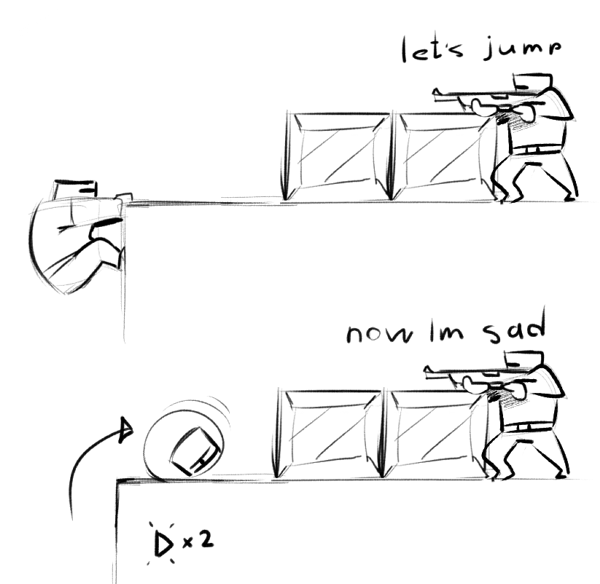 Then the 2nd one, i'd enjoy the ledge version of that, but I'm neutral on the "roll over obstacles" one, since, well this very position has some positive factors and negative ones - by that i mean: it's actually the players fault if he gets into position like that, which means he has to find his own way out. He, himself has given his opponent an opportunity that may become fatal, and because of that i don't think that there should be such an easy way to push the player that has a gun on you (Basically an easy way out). But that's all ofcourse only my opinion and you can critique me on that. Also, I've got some questions about the first one, is this going to work only for players that are in the same team? Is this move going to take stamina? 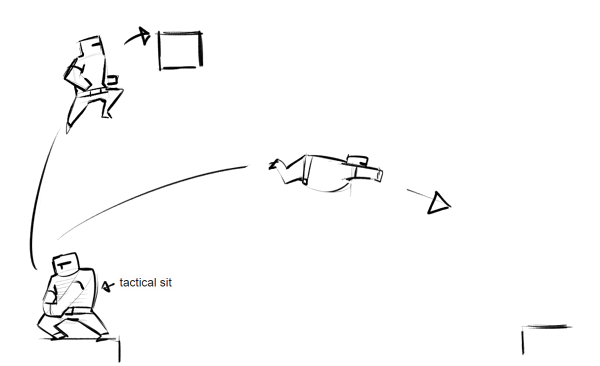 And even if the move is going to be added, here's a little suggestion to the developers: make it so that the player who is going to be flung up in the air needs to sprint towards the player who's "tactical sitting", else the move could become abusable. When it comes to the 3rd one, i don't really think we need that, since we already have ledgegrabs (like Rick already mentioned), and i think that's enough. Also neat drawings . This is great, But what would be the added controls for this? Rolling over objects and giving people a boost would be two very cool additions. As of now the only teamwork moves we have are throwing and catching guns and catching someone with a dive while they’re falling. The good drawings in the post are what make it stand out from other suggestion posts. Maybe the roll over objects could also be a "vault" movement? Same controls, but different animation. maybe this could be tested out by first adding it to only zombie survival mode which heavily relies on teamwork. Whats a recovery roll? and link to a vid or gif of it in use if you could. To be frank, this is something I don’t really know how to explain. It’s just something you “know” after playing the game for a while. I will try my best to explain. This is a roll that can be performed after an action. An example can be punching then rolling to jump and punch again. In the updates after 1.0.2c this is no longer possible right away. Another example can be when you get knocked over and you can roll in the other direction. I believe this type of recovery roll is still implemented in versions after 1.0.2c, but I could be Wrong. I think this would be an awesome addition to the game because it will show off how far the devs are willing to go with a platformer game. It would make the campaigns a much better exeperience, promote more team versus matches, and would also give the players more flexibility.